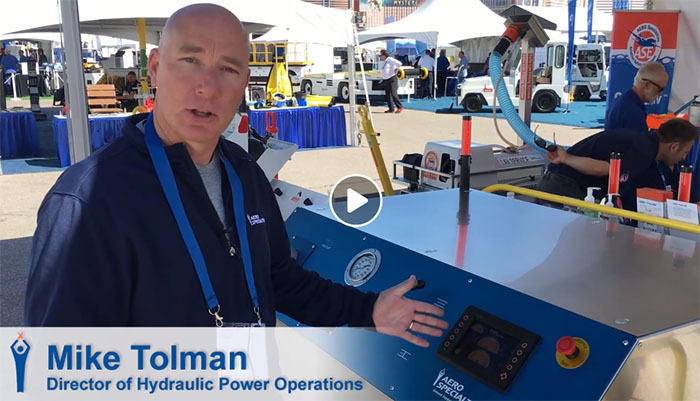 AERO Specialties’ new line of Hydraulic Power Units utilize state-of-the-art technology to offer more flow, more power, and less noise all at a competitive price. AERO’s HPUs are fitted with a modern digital display accompanied by an easy-to-use, software-driven operator interface. The included software allows for quick and easy access to settings, aircraft presets, calibration schedules, and more. Our engineers developed these industry changing units with invaluable input from MROs and certified AMTs from around the world. Our HPUs offer advanced aircraft safety features, as well as electrical soft start that extends motor life by saving your motor from unnecessary wear and tear. AERO Specialties Director of Hydraulic Power Operations Mike Tolman took time out from the recent International Airport GSE Expo in Las Vegas to talk about the latest AERO designed and manufactured Hydraulic Power Unit – a fast, simple and efficient operating system for testing your aircraft hydraulic system. Just click below to view the video. Want more info? Just click here to view more info on our new line of HPUs and request a quote!